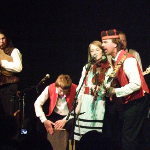 Sattuma is a folk music quartet from Petrozavodsk in Russian Karelia. Sattuma is a "family quartet" based on the idea "from the fathers to the children" and also "from the children to the fathers". "Sattuma" means happenstance or chance, but it also means "hit the mark". The program developed long and slowly, somewhere back in the mind, but came about by chance. Within a short time, it brought forth great results within the family circle as well as on stage. Sattuma concerts have been met with great enthusiasm in Russia, USA, and Finland.